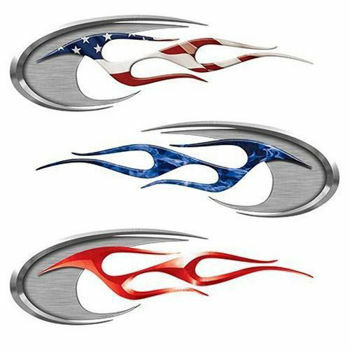 Add some originality to your motorcycle with these Thin Flame Custom Motorcycle Tank Decals from Weston Ink. With our excellence in quality and design, this is a great alternative to an expensive air brush custom paint job at a fraction of the cost. Best part of using vinyl is that if you decide to change it up you can. These graphics are also safe to clear coat over should you want to make it more permenant. Designed and produced in house using the the best materials and newest processes available. Using the newest printing technology with a 7 color process these graphics pop in color and are highly detailed. Using the latest ink technology this also extends the life of the graphic for years to come without any fading. These work great for motorcycle tanks, saddle bags, golf carts, fenders and much more. 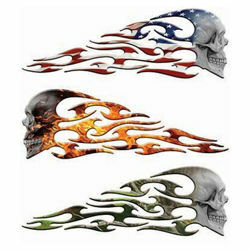 We also have thinner designs that match up the flame style to make it a complete professional package.